The Jasmine scenting will dissipate after the first infusion, but the tea will brew perfectly well again. 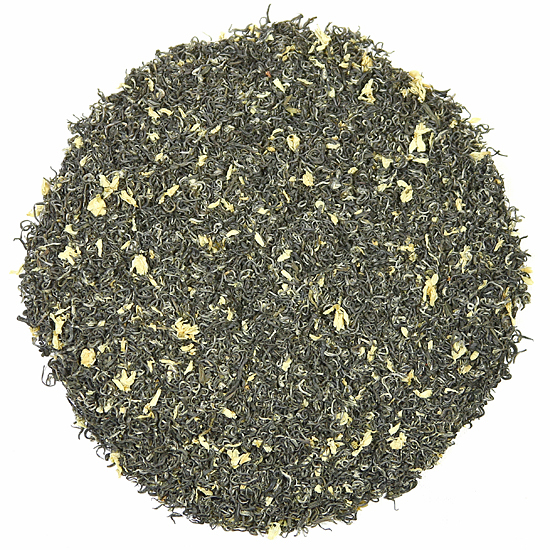 Our most elegant Jasmine tea with a sweet, aromatic perfume! Jasmine Snowflakes is from Mengding Mountain, a highy-revered Buddhist mountain in Sichuan Province. We first tasted this tea in Chongching on our way to Mengding Mountain and instantly loved its freshness and vitality. Once we arrived at the foothills of Mengding Mountain we asked who was the ‘best’, (code for reliable and experienced) local Bi Tan Piao Xue tea producer. We visited several contenders and tasted their tea. When we found this tea we and arranged to have some sent home to us for our customers. 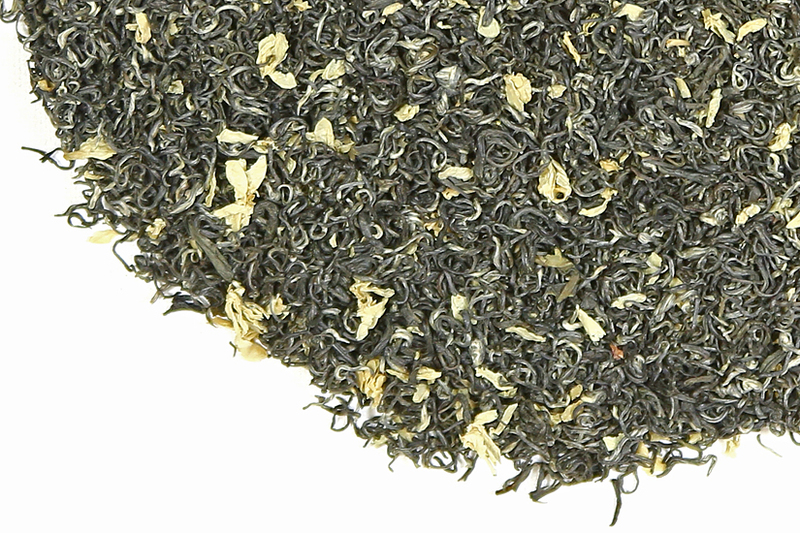 This tea has been extremely popular since we first introduced it many years ago. . 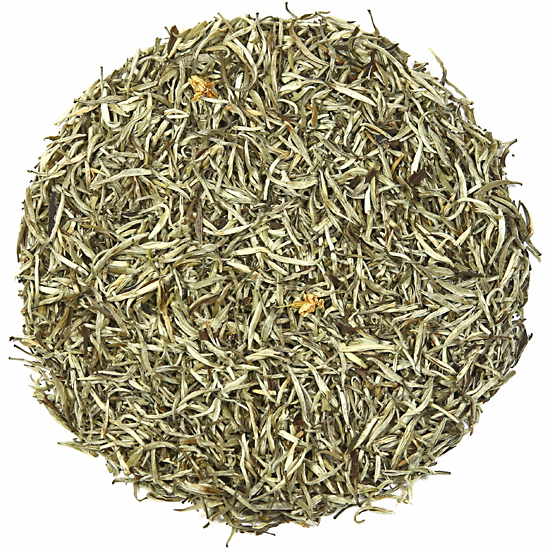 There are many differences between Jasmine Snowflakes and the Jasmine teas of eastern China. For one thing, the leaf is darker in color, smaller in size and very thin and slightly twisted. All of which contributes a stronger tea taste in the cup. The scenting manufacture is different than that of Fujian also. The leaf is available earlier and the Jasmine blossoms later, so the finished tea is generally available in our deep winter, when it is a delightful breath-of-spring during our snowfalls. The Jasmine blossoms used in our Jasmine Snowflakes deliver the sweetest, most ethereal aroma we have yet to encounter, and the addition of small whole Jasmine petals and blossoms (a purely decorative touch – the Jasmine aroma is contributed by a series of batches of fresh flower blossoms that are repeatedly ‘wed’ to the leaf during manufacture) provides a lovely contrast to the color of the tea. One of the few teas drunk with food in China, this tea helps cool the burn from Sichuan chiles and Sichuan peppercorns (not complaining !) which are used quite liberally in most dishes in the Sichuan countryside. Food aside, this tea is a joy to drink while just passing the time of day on a sunny afternoon. We discovered Jasmine Snowflakes after a riotous Hot Pot dinner adventure at a riverside family restaurant in Chongching. We drank this tea as we looked out over the cruise ships queued up and riding high on the Yangtze, waiting to take on their passengers on the sightseeing trip down the Three Gorges. This lovely Jasmine tea really did cool our palate, much better than beer or water.